The Jackson's widowbird has an unusual way of attracting a mate: it jumps… and jumps… and jumps! A competition is taking place. The event is the high jump. These male Jackson’s widowbirds are showing off their skills. They’re jumping to impress the female widowbirds, who watch carefully to see which one has the best technique. The male widowbirds are larger than the females, and they’ve grown long, fancy tail feathers especially for the breeding season. The females will choose their partners based on the length of their feathers and their jumping abilities. So the males keep jumping… again… and again… and again… until eventually, the competition is over! The female makes her choice, and the male can take a well-earned rest. So how crazy is the male Jackson’s widowbird? It grows long, fancy tail feathers, and competes at high jump to attract a female partner! 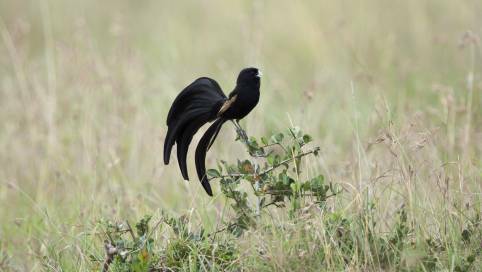 Male Jackson's widowbirds try to impress females by jumping high into the air. Male Jackson's widowbirds also grow long tail feathers especially for the breeding season. The female Jackson's widowbirds choose a partner based on the length of his tail feathers and his jumping abilities. Why do male Jackson's widowbirds jump into the air? Why do you think the Jackson's widowbird grows its long, fancy tail feathers only for the breeding season? What might happen if it had them all year round? Can you think of another animal whose appearance changes over the year? Why does this change happen? Complete your lesson with teaching resources on reproduction from Tigtag.